Diehard Sri Lankan Freedom Party (SLFP) voters in Attanagalle, the Gampaha district town that gave the country three heads of state, were in a quandary over their vote with the party split by the two main candidates. Attanagalle is known as the heartland of the SLFP, producing two prime ministers, S.W.R.D. Bandaranaike, Sirimavo Bandaranaike, and a former president, Chandrika Kumaratunga. But with Mahinda Rajapaksa and his main challenger Maithripala Sirisena both being stalwarts of the same party at Thursday’s presidential election many of the townsfolk didn’t know which way to vote. Voter apathy was evident early in the morning, with few people turning up at the polling booths, but picked up later, and at the end of the day some 80 per cent had had cast their ballots. At the end of counting, Mr. Rajapaksa won the electorate, securing 54,777 votes, with his rival coming a close second with 50,380 votes.Although Sirisena could not win the Bandaranaike-Kumaratunga bastion, the former President, the key figure behind the Sirisena campaign, succeeded in reducing the 47,068 majority the UPFA received at last year’s Western Provincial Council election to 4,397 at Thursday’s election. Neil Aruna, 38, a supplier of firewood, was among those who changed their normally pro-SLFP vote to back the Opposition candidate, Mr. Sirisena. “The country needs a change of government and so my choice this time was for the Opposition common candidate, Mr. Maithripala Sirisena, because at the end of the day he too is from the SLFP and has promised a change,” Mr. Aruna said. Mr. Aruna said he decided to change his party affiliation because of the one-sided propaganda carried out by state media against the Opposition candidate from the start to the finish of the election campaign. “These same media channels could have deliberated on the corruption and bad governance of the ruling party and officialdom but instead they opted to protect crooks and undesirables while attempting to show the Opposition in a poor light,” he said. His feelings were echoed by 61-year-old E. Dharmasiri, who operates a wayside tea kiosk and is looking forward to change in the electorate and the entire country. “In the past this region was a strong SLFP stronghold and people would blindly vote for even a pol pitha (coconut branch) if it was attired in blue but all that has changed,” Mr. Dharmasiri said. He cautioned Ms. Kumaratunga, daughter of the two Bandaranaike prime ministers, against getting too involved in Opposition politics. “President Kumaratunga was a past president and should remain that way, simply providing whatever assistance and co-operation to the common candidate,” Mr. Dharmasiri said. 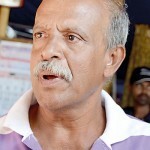 He said the three Bandaranaikes had neglected the electorate to serve the rest of the country. “I went barefoot to school, which lay more than 1km from my home, with my books bound together with a rubber strap, carried on my head,” he said. “There was no electricity in the village and only the Bandaranaikes and their relatives and friends enjoyed this facility. “In fact, it was the late president Ranasinghe Premadasa who finally lit up my village and others surrounding it,” Mr. Dharmasiri added, commending the former United National Party (UNP) leader for this action. Elsewhere in the Gampaha district, large numbers turned out to vote from Hendala-Wattala to Ragama, Kandana-Jaela, Katana, Negombo and elsewhere. Voting was brisk in these areas, which have a large concentration of Catholics and minority races. Mr. Sirisena was able to achieve victories in all these areas with comfortable majorities. Here, too, traditional SLFP voters had opted to vote for the Opposition. 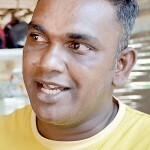 N.D. Indrajith, a small-scale businessman from Kandana, is a close relative of a powerful SLFP politician in the area who has close connections with Mahinda Rajapaksa’s family. Like many others, Mr. Indrajith said he voted for the Opposition candidate and claimed that hundreds of other SLFP voters known to him and other party supporters had done the same. “So many people needed a change, and that opportunity was provided on Thursday,” he said. His relative, K.H. Jayewardene, maintained support for Mr. Rajapaksa regardless of the election result. A Catholic man who did not wish to be named said he was grateful to Mr. Rajapaksa for arranging a visit to the country by Pope Francis and therefore he had opted to vote for the past incumbent. Notwithstanding the surprising changes in alliance among many voters in this seat, polling in Gampaha ended peacefully with near-zero incidents reported, as was the case in most other parts of the country.